"Bringing Great Stations Back To Life Since 1997"
DISCLAIMER: These jingles remain the property of the person or entity who recorded them. I am receiving no monetary gain from posting these; they may be downloaded provided the content is not altered in any way. Jim Gosa wraps up his show giving the full signoff-type legal ID. 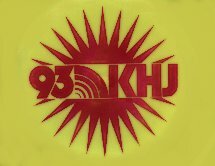 Station later changed calls to KKGO and kept the jazz format until after they went classical KMZT. They are now a Country station. Finally - another memorable jingle from The Mighty Met! Hear the harmony of the singers telling us what is the place to be! The famous "boogie-woogie"-type female jingle from the 1970s is now here for your enjoyment. On July 24, 1996, at about 12:40 P.M. (appropriate time), AM 1240 KSON switched over to the Children's formatted KidStar Radio Network. After about 10 seconds of what sounds like a metronome, an outer-space-type countdown takes us to the new (albeit short-lived) format. At 5:00 PM, the last day of June 2000, Mr. Smokey Robinson was given the honor of flipping the switch to take Mega to 92.3. For a few seconds, 100.3 actually did go off the air; you can hear bleedthrough of another station playing The Eagles' Lyin' Eyes -- and if you listen closely about 2:46 into the clip, you can make out someone yelling, "Yabba Daba Dooo!" This segment includes a commercial for a radar scanner, and a funny ad for 7-Eleven's new Breakfast Bite. At 2:54 into the clip, John Logic thanks everyone at The Edge for their support (great roster of station personnel!) Concludes with call-in "Midnight Legal ID" segment. Rick Scarry and Raechel Donahue team up for the final time to brighten a very dark morning in Los Angeles. Includes the traffic report where I got jingle traffic3.wav (funny lyrics). Watch out for that plywood! Four years after the Go-Go's break up (she erroneously says it was five),one of them sends her condolences to the station via telephone. Further enhancing The Edge's last day was a "visit" from one of 1989's top newsmakers. Well, not really, but you make the call. Also on 101.9, Alison King asked a scientific trivia question every morning on Raechel Donahue's show. Prizes varied. Similar to Ain't Misbehavin' with '20s-style megaphone voice. That moment's traffic report (of course, it's kinda old now!) can be heard on "Last Scary News" file above. 101.9 The Edge "...midnight legal ID" jingle. The fourth caller after the jingle had the honors of saying the station's legal ID over the air. On their last day, they let their first seven callers have the honor. May 11, 1989 about 11:58 PM. The countdown ended around midnight, Dec. 31, 1976. Following the #1 song (Don't Go Breaking My Heart by Elton John & Kiki Dee) and the legal ID, they rebroadcast the countdown, right after this wonderful recap of the year's highlights as only KHJ could tell it! Recorded March 1989, when Pirate Radio was less than two weeks old. KQLZ Legal ID; also recorded March 1989. "Transmitting throughout North America . . . "